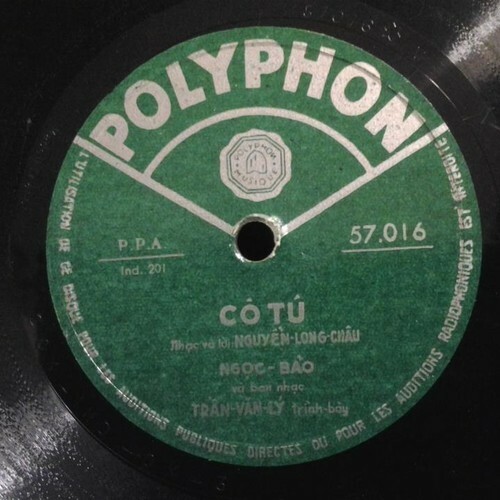 Finding Vietnamese 78rpm records is not that easy, even though a lot of them were pressed here in France during the colonial period, when Vietnam was still part of French Indochina. This one comes from a lot I bought from another collector in Paris. Thanks to Haji Maji and Excavated Shellac blogs, I was already familiar with some 78rpm recordings of Vietnamese folk music, but it was the first time I heard early popular music from this country. The earliest involvement of the Vietnamese with the popular song idiom came about through French songs using Vietnamese lyrics interpolated into the dramas of the cải lương musical theatre genre in the 1920s. The earliest original songs emulating Western styles began to be created in the mid-1930s. Once this genre began to become popular in the 1940s, Vietnam was plunged into a war against the French. While many Vietnamese spent the years of the First Indochinese War (1945-1954) in the maquis – mostly mountains, forests, and swamps under the communist Việt Minh forces – a large number lived in cities in relative peace under French control and protection. It was during this time that a Vietnamese popular industry with published sheet music, shellac records, stage performances and radio shows began to take shape. The singer of “Cô Tú” is Ngọc Bảo, one of the most famous singing artists from Hanoi before 1954. I knew him before he died about 10 years ago. He had recorded some sides in France in the 1950s, but I wonder whether this is one of them. It lists the accompaniment as being by Trần Văn Lý a bandleader from Huế – but all I hear is a solo guitar. Ngọc Bảo was a singer for the Hanoi radio station from about 1950-1954 and was very popular. He was given the appelation tài tử which is commonly translated as “talented amateur”. That was a term of respect and implied that he sang for art and not for money. But I can’t imagine that he didn’t get paid. It probably meant that he didn’t sing at clubs or dancehalls, but I know that he did sing at movie theaters (it was common then to have a music group perform before the film). I know that he had many fans among the broadcast audience. He chose to stay in Hanoi after 1954, and while he was not mistreated by the communist regime (one of his old friends was the Premier of the Musicians Association) it became difficult for him to perform because his style of music became outlawed. He made something of a comeback starting in the 1990s until his death. This is a song composed around 1945 or 1946. The composer is Long Châu. I know very little about this songwriter. I’ve met someone who played in a band with him, but that’s about it. The song is fairly unknown today, but it was very popular in the 1940s and early 1950s – I’ve met a few octogenarians recall this song. The subject matter actually relates to adult literacy – there was a movement to bring literacy to the peasantry around that time. Cô Tú means Miss Tú and it’s about her learning to spell and read. Ask whether, ask whether Miss Tú can spell yet? Năm nay quên hết nên chưa biết gì. This year it’s all forgotten, she doesn’t know a thing. Vẳng nghe ai học chữ i, chữ tờ. The book with “i” and “t” gifted but not allowed to learn. Liệu cô mình đã đọc được chưa? I wonder if our Miss has read them yet? Lấy cô hay chữ để mà cậy trông. Someone would marry her if she were literate to rely on. Ruộng vườn thóc lúa tính thông cô chẳng nhầm. Gardens and fields, calculating the rice you’re never off. Xin cô mình đừng phí ngày xanh. Cô nên tới đó học hành cho thông. She should go there to study until she’s fluent. The words are evidently a sort of folk poem (ca dao) created through the Bình Dân Học Vụ – Popular Education Office. This organization was one way for patriotic Vietnamese to be nationalistic and patriotic and to organize without upsetting the French colonial authorities too much. It mostly follows a folk poetry form called lục bát (or six eight) reflecting the alternation of six and eight syllable lines. Additionally the sixth and eight syllables set the rhyme scheme that you can see below. This pattern is very obvious in the singing and would have made the song very easy to remember, especially for the illiterate. The book with “i” and “t” the French won’t allow to be learned. I am very grateful to Jason Gibbs for this great contribution! Thanks also to Dave Murray and Jonathan Ward for their help. In conclusion, here is a link to a similar Vietnamese recording on Sonidos Perdidos blog. Why not, I will maybe post something else from that lot in the future. I remember listening to my grandma singing the song to put my little brother to sleep when I was small. The song, and the precious memory about grandma were almost forgotten until my friend share your blog on her fb today. As I listened to the song, I slowly recognised it, then came the overwhelming memory of the sunny afternoons in Hanoi with grandma having my little bro in her hands swinging slowly singing the song. I’d never known what the song was called and where it came from until today. Thank you so much for sharing. I can’t tell you enough how much this has meant to me. Thanks for this kind comment! Lovely, and fascinating background to the song. Có khi nào là “Sách i tờ biếu không (để) cho học” không nhỉ? Hello, someone translated your comment for me, thanks for this suggestion regarding the lyrics.